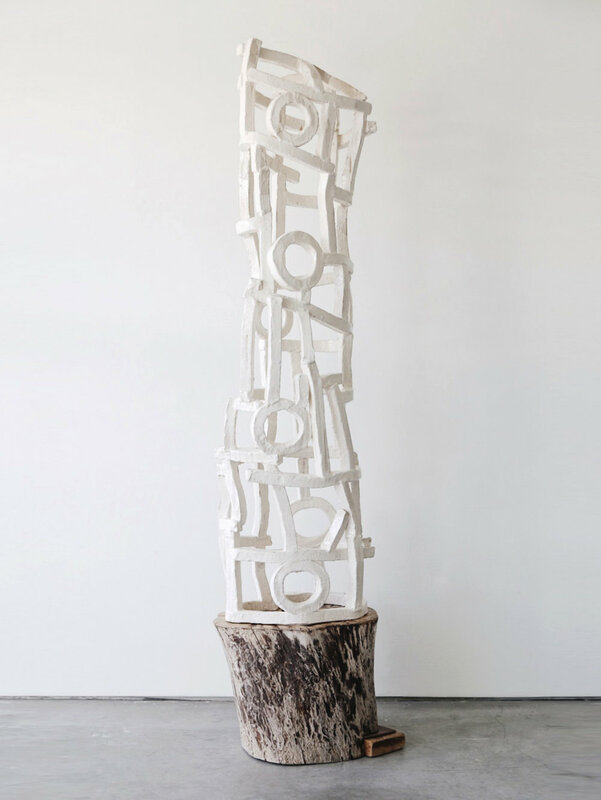 Reese’s sculptures are predominantly known for their simple, familiar forms created in a variety of methods and at such large scales that they push the traditional boundaries of ceramic art. Artist, Brandon Reese, works primarily with stoneware and porcelain. His sculptures playfully and beautifully express the idea that relationships offer a unique ability to enhance the individual elements while simultaneously unifying them to create a powerfully emotional and visual experience. Artist, Brandon Reese, works primarily with stoneware and porcelain. 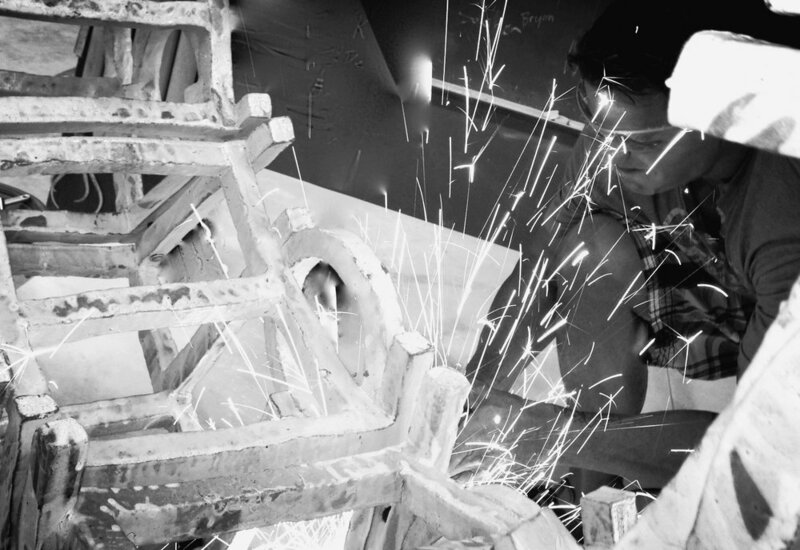 He received his BFA in sculpture from the Kansas City Art Institute where he became proficient in bronze, cast iron, steel, wood and ceramics. While in Kansas City, he apprenticed with Jim Leedy until pursuing a graduate degree specializing in ceramics at Bowling Green State University. There, he had the privilege of working with artists Jun Kaneko, Don Reitz and Peter Voulkos. 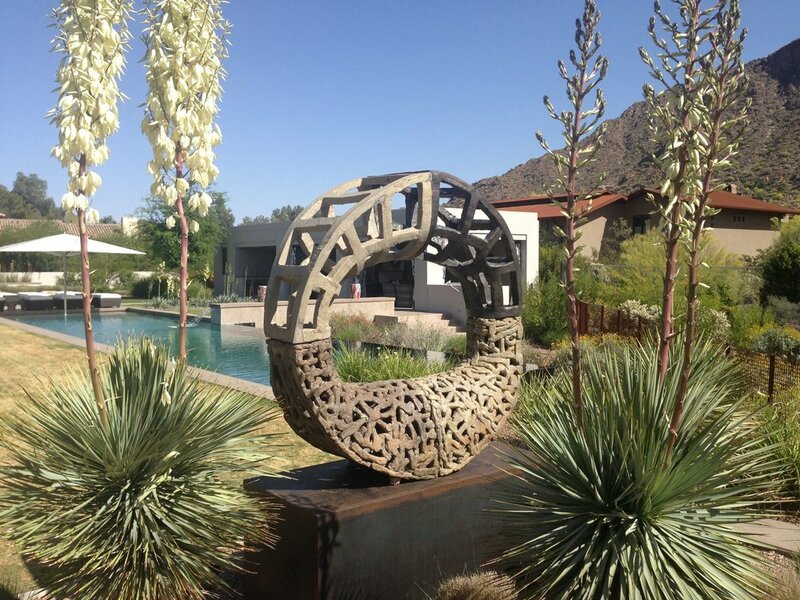 While at Bowling Green, he focused on salt and wood firing for creating unusual and varied surfaces on each sculpture. 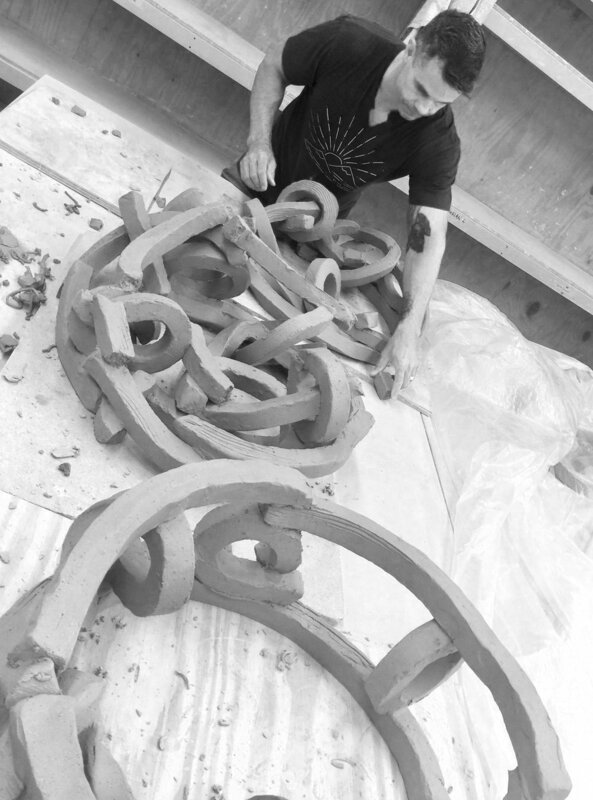 Upon graduation, Reese was hired by Oklahoma State University as an assistant professor of its newly expanded ceramics department. 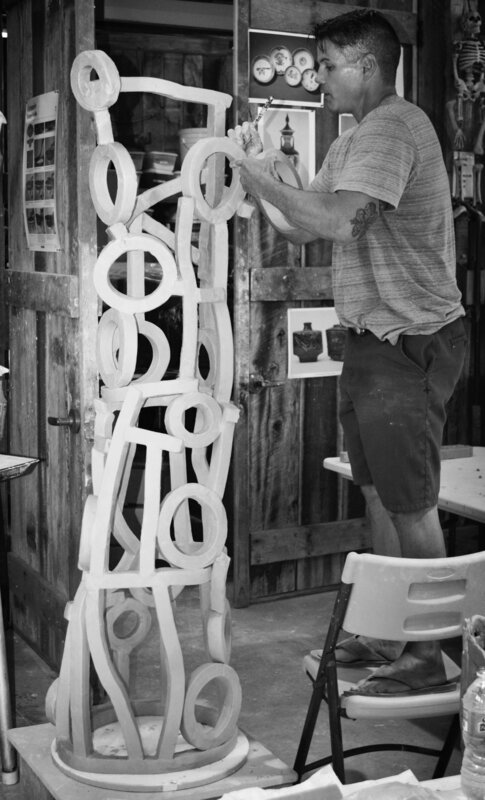 In addition to teaching, Reese regularly exhibits his large-scale ceramic sculptures. His work has been exhibited in Germany, Taiwan and across the United States. Life motivates my work. An amalgamation of memories, images and relationships inspire all that I do. My fascination with architecture and patterns in life becomes the language that exposes my intrigue with the relationships that connects individuals. Scale heightens the visual experience of these structural investigations…playfully defining space and pushing the boundaries of ceramics. My work also relates my belief that the best part of life is the process; and that true success comes when one can wear all of the marks that life leaves with beauty and grace, allowing them to become an integral part; and serving as mementos of where one came from, and how one got there. My art wears the fingerprints, cuts, dents and other texturing as a roadmap and documentation of its creation. We hold an innate desire to build, to grow, to leave our mark.The playfulness and precariousness in my pieces show the dichotomy of our fragility and strength. My recent body of work is about inviting the viewer into the space it consumes. What isn't there is as important as what is there. The multiple pieces coming together into one collaborative design speaks to the belief that we are our best when we are in relationship with others. Although we maintain our own individual identity, when we are paired with others we are stronger and make a much greater impact to the world around us. The circles in my pieces symbolizes eternal life and reminds us so delicately that our experience on earth is temporary, and at times too brief. But the foundational element of love lasts beyond our existence, and if we are fortunate, we leave added value and beauty to those we have laughed, cried and lived alongside. M.F.A. Ceramics. Bowling Green State University. Bowling Green, OH. Post Undergraduate Study - Ceramic sculpture. Kansas City Art Institute. Kansas City, MO. B.F.A. Sculpture. Kansas City Art Institute. Kansas City, MO. Art Major. Cameron University. Lawton, OK.
Thirteenth San Angelo National Ceramic Competition, San Angelo Museum of Fine Arts. San Angelo, TX. (curated: juror – Mathew Kangas, national, catalogue). Storrs, Michael. “Brandon Reese: Reinventing the Wheel”. Auditorium. Summer 2014. Paglia, Michael. “Review: Mixing Painting and Sculpture is a Winning Formula for Havu and Walker Galleries”. Westward. November 19, 2014. Brandon Reese. Macy (image inside back cover). Luxe: Interior + Design (Colorado edition): Volume 10, Issue 4, (Fall 2012). Paglia, Michael. “A Thoughtful Pairing Puts a Fine Patina on Walker Fine Art”. Westword: Denver. Denver , CO. December 4, 2012. “Crafting Ritual and Identity: presented by Brady Craft Alliance”. Brandon Reese. Savannah. Veil White. (images front cover) Living Arts of Tulsa: August 2012. Valley Guide 2011: Phoenix, AZ. Reese, Brandon. Nelli. Pasatiempo. May, 2010. Zimmerman, John. “The Structure of Things: The Scuplture of Brandon Reese”. Ceramics Monthly. February 2010. Ute Junher. “Exploring L.A.’s Hippest Hoods”. Australian Press. Aug. 8-30, 2009. “Brandon Reese, New Work.” Santa Fe New Mexican: Pasantiempo (Aug. 6, 2004). “Ceramic Sculpture, Brandon Reese.” THE: Magazine of the Arts (Aug. 1, 2004). “Reese at Chiaroscuro.” Artbook of the New West (spr./summer 2004). “Vision Makers.” Stillwater News Press 6 Feb. 2004: A13. Cain, Marcus. “Clay from the Middle Ground.” Ceramics: Art & Perception 52 (2003): 99. Watson, Tami. “One-man Show Opening at MAINSITE.” Pop (17 Jan. 2003). Gill, Peter. “MAINSITE Hosts Two Showings.” Oklahoma Daily (17 Jan. 2003). Brandenburg, John. “Sculptor Looks for Self.” The Daily Oklahoman 24 Jan. 2003. Jones, Preston. “Truth and Ceramics.” Oklahoma Gazette 23 Jan. 2003. Dillon, Pamela & Simmons, Carol. “Abstract Details, Abstract Forms.” Dayton Daily News 12 Jan. 2003. Dunn, Shari. “Reese’s Pieces.” Vanguard Inaugural (2003). Williams, Gerry. “Brandon Reese.” Studio Potter 130 (June 2002): 84-85. Brandenburg, John. “Two-man ‘Bridges’ Show Joins Artists.” The Daily Oklahoman 7 Dec. 2001. Brandenburg, John. “Solo Shows Identify Artists’ Personalities.” The Daily Oklahoman 10 Nov. 2000, sec. 7:B. “Abstract to the Max.” Vivid (Nov. 2000). “Brandon Reese: New Ceramic Sculpture.” The Daily Oklahoman 20 Oct. 2000. “Ceramic Sculpture.” Oklahoma Gazette 18 Oct. 2000:48-49. “Reese’s Pieces.” Pop (20 Oct. 2000): 12. Trafton, Robin. “Artist Expands the Boundaries of Ceramics.” The Kansas City Star 4 Aug. 2000:32. “Brandon Reese at the Leedy-Voulkos.” The Review (July 2000): 10. Brandenburg, John. “Exhibit Provides Artist Vision for All to View.” The Daily Oklahoman 28 Apr. 2000:5. Contemporary Clay: Master Teachers/Master Students, Fine Arts Gallery, Bowling Green State University, Bowling Green, OH. (Catalogue). “Clay Mania.” The Columbus Dispatch 9 Mar. 1999, sec. 8:F.
Scott, Rebekah. “News of Art.” The Blade: Toledo, OH April 6 1999. Dupont, David. “BGSU Exhibit Breaks the Mold.” Sentinel-Tribune 21 October 1999:20. Finalist Salzbrand Keramik 2006 - Salzbrand Keramik 2006. Galerie Handwerk Koblenz. Koblenz, Germany. Arts Educator of the Year Award - Niche Magazine nominee. Philadelphia Buyer’s Market of American Craft. Philadelphia, PA.
Finalist First Taiwan Ceramics Biennale 2004 - First Taiwan Ceramics Biennale 2004. Taipei County Yingge Ceramics Museum. Taipei, Taiwan. Honorable Mention - Wichita National. Wichita Center for the Arts. Wichita, KS. Juror - Josh DeWeese. Promotional Poster. NCECA student show. Columbus, OH. Honor Roll. Bowling Green State University. Bowling Green, OH. Dean’s List. Kansas City Art Institute. Kansas City, MO. Competitive Scholarship. Kansas City Art Institute. Kansas City, MO. Outstanding Freshman in the Field of Art. Cameron University. Lawton, OK. Competitive Scholarship. Cameron University. Lawton, OK.